Sanmenli 三门里村落. 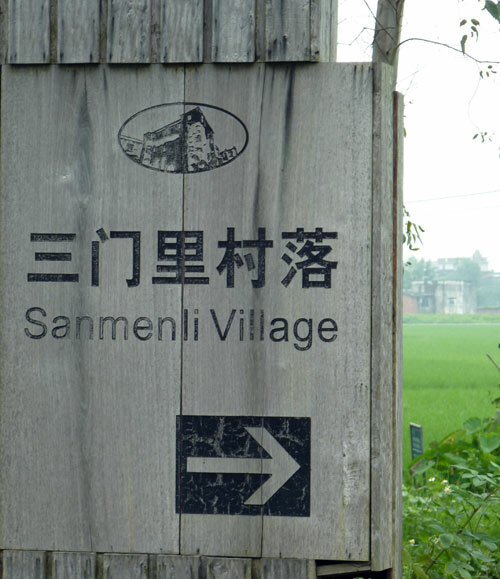 If ever there were a sleepy place where nothing ever happens it has to be Sanmenli Village. 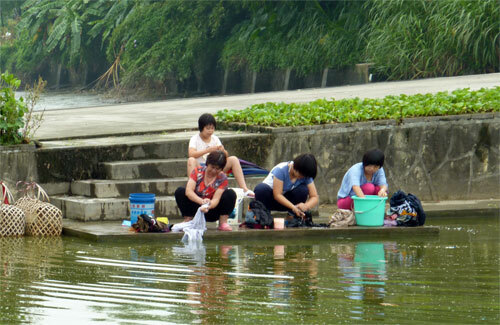 Tranquility and peace imbibe this pretty village only a few kilometers from the large and ugly city of Kaiping 开平. 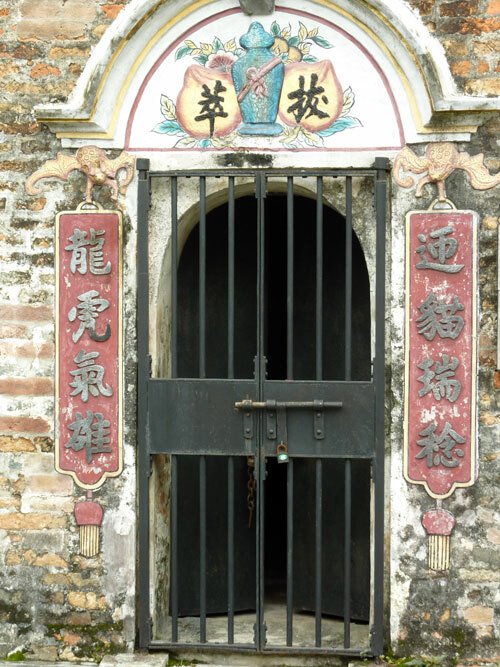 Being so close to Kaiping, Sanmenli is easy to miss; we nearly did! 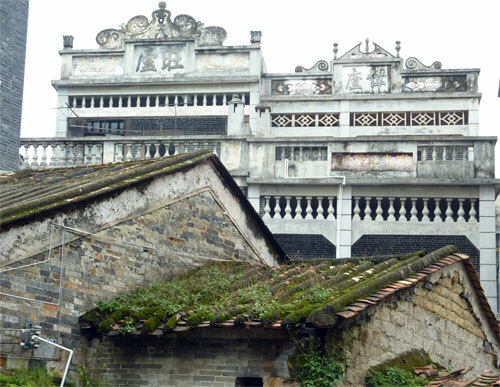 As you leave town, keep your eyes peeled on the right and you’ll see a cluster of fabulous- looking old houses, straight out of the China you imagine existed centuries ago. We couldn’t quite believe what we were seeing. If this were Shangrila Yunnan, there would be a coach park, souvenir stalls and thousands of flag- waving tour guides with their camera- toting and mobile phone – fixated hordes traipsing behind them. It seems that the rural and architectural charms of Guangdong Province have largly escaped the scourge of Chinese mass tourism. Still, it was curious to see a clearly marked signpost, both in English and Chinese, pointing in the direction of the village (See getting there), given how few people actually visit. We had the whole place to ourselves on a weekend in August. 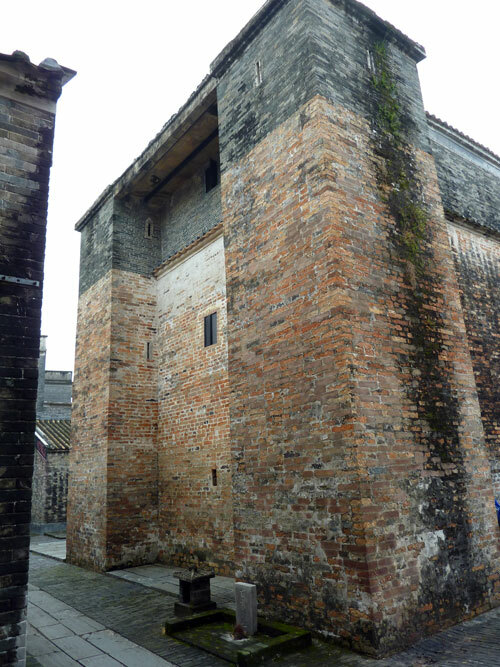 The entire area around Kaiping is famous for the fantastic Diaolou buildings 碉楼 (Fortified buildings used as watchtowers: Click here). These magnificent structures can be seen everywhere, sprouting out of paddy- fields or hidden between the housing blocks of encroaching urbanization. 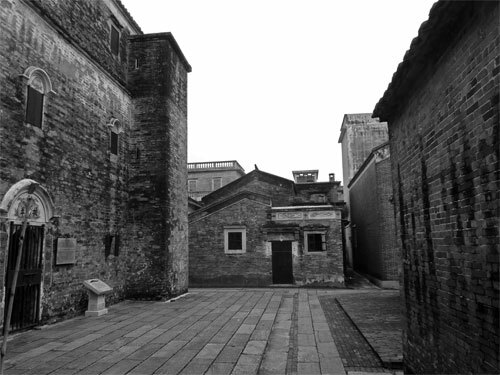 However, Sanmenli is different from other villages in the Kaiping area, due to the imposing and unique Diaolou building in the centre. 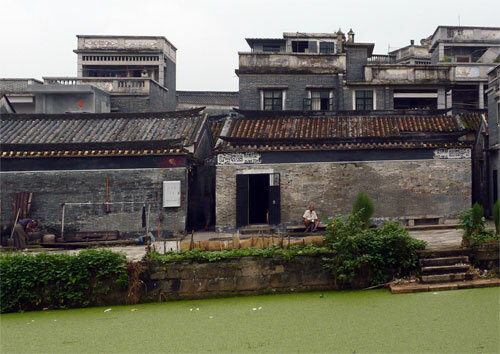 Sanmenli’s claim to fame is Yinglong Lou 迎龙楼, the oldest surviving Diaolou building in the region. 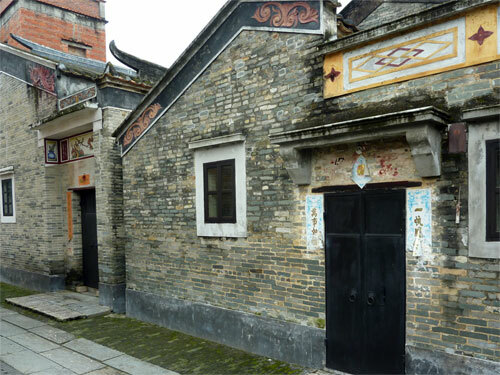 Yinglong Lou was built between 1522 – 1566, during the Ming dynasty, and was used as a communal place of refuge for all the residents of the village. Originally a two- storey building, constructed from the reddish bricks typical of the Ming era, a third level was added in the 1920s using blue bricks, which explains the different shades of the façade. 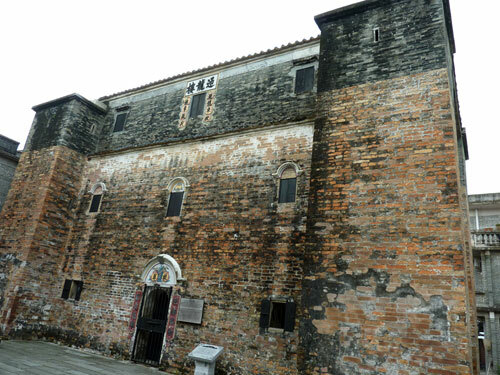 It certainly has a different and distinct style from the rest of the Diaolou dotted around the countryside near Kaiping; Yinglong Lou 迎龙楼 is a great deal more squat and solid than the more recent Diaolou constructions and it has the appearence of a Medieval European nobleman’s stronghold; of the type that could commonly be found in Italy around the same time. Unfortunately, Yinglong Lou 迎龙楼 wasn’t open when we were there, but we were still able to enjoy the rest of Sanmenli Village, which is a maze of interesting, sturdy, brick buildings and narrow alleys. Some of the alleys are so narrow and tight that, as you pass through, you can’t avoid catching glimpses of the intimate lives of the residents. The kitchens are especially open to view and you can still see people using ancient cooking implements and tools. 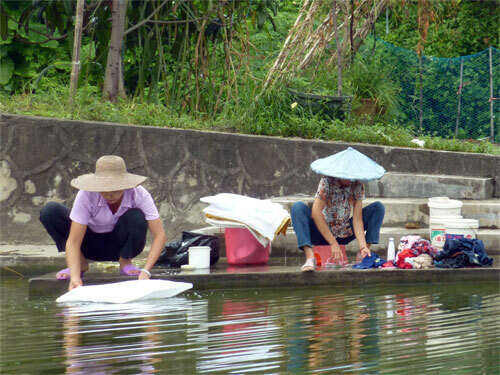 On entering Sanmenli there is a large tank where locals gather to wash clothes and vegetables, and catch up on the local gossip … if there is any; remember this is the place where nothing ever happens! If you’ve hired a driver from Kaiping, ask him to take you to the village; it’s a short, half a kilometer diversion from the main road. 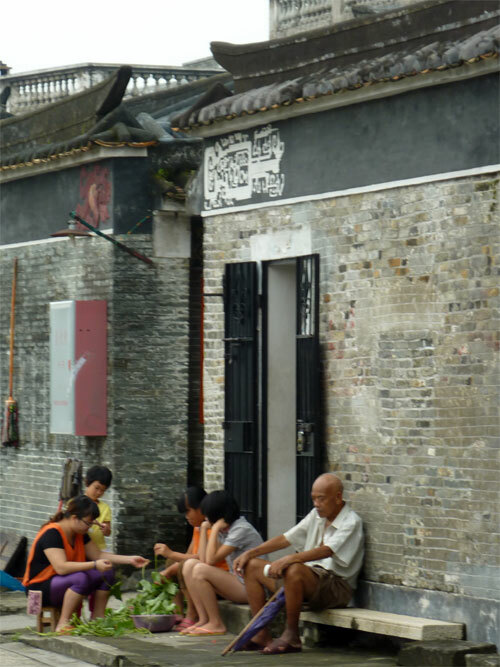 If your driver doesn’t know it, keep your eyes open for the first old village on the right after leaving Kaiping. If you are bus- hopping on public transport around the Diaolou Villages, the bus driver on the route to Zili Village 自立 or ChiKan赤坎, will know where to let you off. Getting to Kaiping is no sweat; there are buses from all Guangzhou bus stations, though it can be difficult to get an exact timetable. As we were staying on Shamian Dao, we used the nearby Fangcun bus station. To get there from Shamian Island, take subway line One from Huangsha and get off at Kengkou station and cross the bridge. There are hourly buses, 60 Yuan, 2½ hours. They leave you at Kaiping’s new Yici 义祠 bus station, which is a few kilometers away from the central Kaiping Binguan and the waterfront. Regular buses from Kaiping also go to Shenzhen, Zhuhai, Zhaoqing (the one we took when we were leaving) and Hongkong.